A class can be defined as the container of objects,methods,variables,fields,properties etc.They will be discussed later in detail . The class members denote class behavior as well as the data within the class.Data may be defined as the logically valid collection of information.Information is defined as the raw data. As C# is a strong object oriented programming supportive language;every class is derived from the object class. In order to work with the members of the class (except static and abstract classes), we have to create an instance of the object of that class by using the new keyword. Unlike other member(s) of a class, we can not declare the object(s) of that class.Declaring is done to inform the compiler about the members,their types,modifiers etc. before execution.Where as object is created at run-time.So how can we declare something which has not yet been created? // This is the way to declare a class by using the keyword class. This is the smart way to access the private members of the class by its public methods.By doing this, we are preventing the unneeded changes in the actual values of the members outside that class. Properties are the named members of class,structure or interface.They are used to access the private members as well as protected members. In comparison to methods, fields do not perform complex computations. They are used to just get or set the values of the members with some normal operations. Use them in place of methods whenever there is a simple operation to be performed. // INSTANTIATE THE WRESTLER OBJECT. A constructor is a an instantiating method of a class which is executed each time when the object is created from the class.The name of the constructor of the class is the same as that of the class.A class can have multiple constructors. In the above example, we have initialized the private variables of Wrestler class with the Wrestler () constructor. We are throwing an exception that if the value inside the parameter of a constructor is lesser than zero then the exception is to be thrown. The above example clearly mention the use of parameters inside the constructor. So yes; constructors support parameters. One thing I want to mention is the concept of polymorphism.When a method having same name is used in different ways such that it’s parameters differ or has different signature(s).It is said to be polymorphic. Destructor is an opposite of constructor.It destroys the instance of the class.It can’t be used in structure.Only one destructor exists for a class.Destructors cannot be inherited or overloaded.The destructor cannot be invoked by the coder. They are invoked automatically.A destructor does not have access modifier(s) or parameter(s). * Constructors also support ref and out parameters.Do some experimentation with them. * Classes are reference types that’s why they are on heaps. Basically every type such as int,char,float is a structure.We use user defined structure with the word struct in order to keep different data type members together .It looks just like as class but it is a value type, that’s why it resides on stack.Structure provides not as much flexibility as a class.They are used for lesser complex scenarios. Structures may contain constructors, constants, fields, methods, properties, indexers, operators, events etc. The this keyword is used to denote the current instance of an object. The constructor in a structure always consists of parameters . Inheritance is the backbone of object oriented programming.As C# fully supports OPP concept, inheritance is the asset in this style of coding. 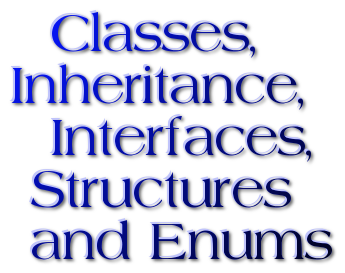 The basic theme of inheritance begins with the term relationship or derivation between the classes,structures,interfaces etc. A class from which another class derives is known as Base Class, whereas the derived classes are called Derived Class. * The derived class can thereby reuse the code in the base class without having to re-implement it. In the derived class, you can add more members. In this manner, the derived class extends the functionality of the base class. * is the derived class of ‘Bank’ class. /*method belonging to Physics class is implemented or overridden in the derived class. A class,struct or an interface can overload a method with different signatures or parameters,having the same name.A good example is the ToString() method.We expect that the readers will read the overloads in this method. A Sealed Class can not be used as a base class.This is useful for better program optimization. Internal: Access is limited to the current assembly. private: Access is limited only to the containing type. How to create an Assembly? Creating single file and multi file assemblies. We know that C# doesn’t allow a derived class to have more than one base class.But a class can we derived from multiple interfaces. Multiple interfaces can be implement in a class but multiple abstract classes can not be used as base class of a single derived class.